Bachelor of Science in Nursing students have the opportunity to test out of or submit a portfolio to earn credit for certain classes. Students must be registered for the term in which the prior learning is assessed by exam or portfolio assessments. Students may attempt the exam or submit the portfolios within 60 days of the chair’s signature. Students must obtain department approval and submit the forms to the Bursar with payment. 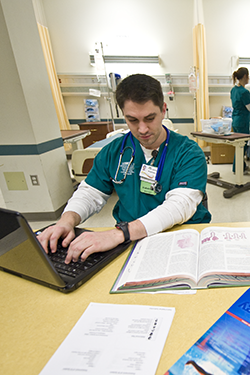 RN-BSN students can test out of a maximum of nine credit hours. Prelicensure BSN: Contact the college at (937) 775-3131. RN-BSN Completion Program: Contact Theresa Haghnazarian at or (937) 775-3131. Alternate Prelicensure BSN Pathway Program: Contact Kelli Jo Haley, Academic Advisor/Recruiter, at kelli.haley@wright.edu or (937) 775-3377; or Sherrill Jeanne Smith, Ph.D., RN, CNL, CNE at sherrill.smith@wright.edu or (937) 775-2665.